My mother-in-law will be hosting Easter dinner this year, so in an effort to set at least one spring table in my own home I pulled out the spring table stuffs for a birthday brunch for the hubs. Probably not the best excuse to indulge my inner Martha (since she so rarely gets indulged) but my husband didn’t mind as long as there were waffles and sausage involved. He played along nicely with my pretty table. Not that he cares about my vintage petalware, but I like to show it the light of day once a year or so. It’s the prettiest white that glows translucent blue when the sun hits it just right. Just right enough for me not to be able to photograph it, so you’ll have to take me at my word. You know me. I need to mix vintage and modern, so I put my “I-love-them-so-much-I-should-marry-them” blue glass Crate and Barrel plates on top. Once those sherbet cups were filled with my mother-in-laws fruit salad the table setting came to life. But no photos of that, because it lasted about .25 seconds before the entire family devoured it! Springtime means my vintage ducks come out to play. They were nestled in the Tall Glass Dome and Villa Pedestal from Willow House. Don’t worry, there was plenty of air in there for them. I promise. It’s really hard to take photos of things in a glass dome! This one came out enough to show the detail of the ducks and moss. Those sweet ducks came from an antique store. I always have to resist the urge to buy more. 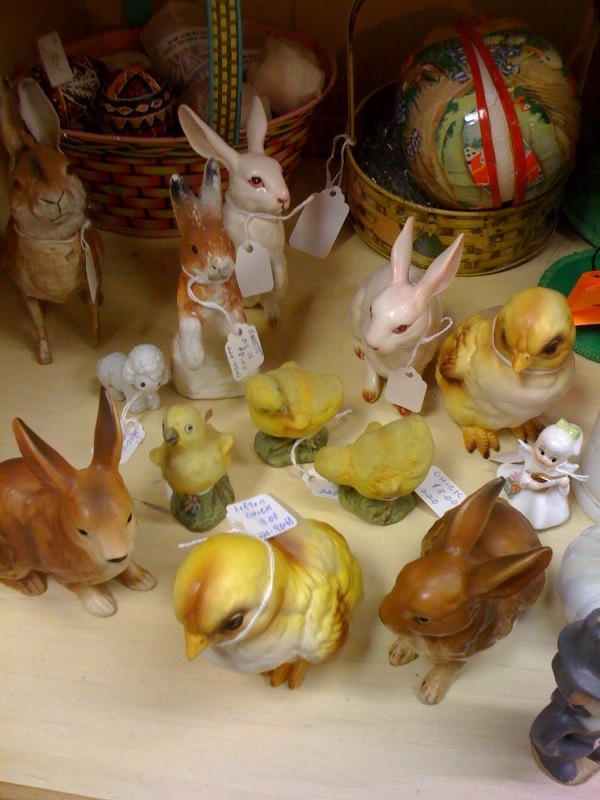 This is a cell phone pic I snapped in an antique mall last year of a few that didn’t come home with me. It’s probably a good thing. There’s not enough air for them in my dome. The other ‘cloche’ is actually a marble cheese plate and glass cover. Picked up from the thrift store for $2. While we are on the subject, the tablecloth was free at a Freecycle swap and the teeny duck planter was a hand-me-down. The tall white milk glass vase? .25 freakin’ cents! I love thrift stores. I’m a super-messy waffle maker, by the way. Just thought I should confess. Making waffles is stressful for me, they never seem to cook fast enough. I was working on getting them cooked for my hungry crew, so I wasn’t able to take more photos. Not sure why it’s always so hectic. And of course Noodle stole the show by putting the bow from her daddy’s gift on her head. Girlfriend can rock a curly ribbon bow! By the way, remember that forsythia I kept begging to bloom? 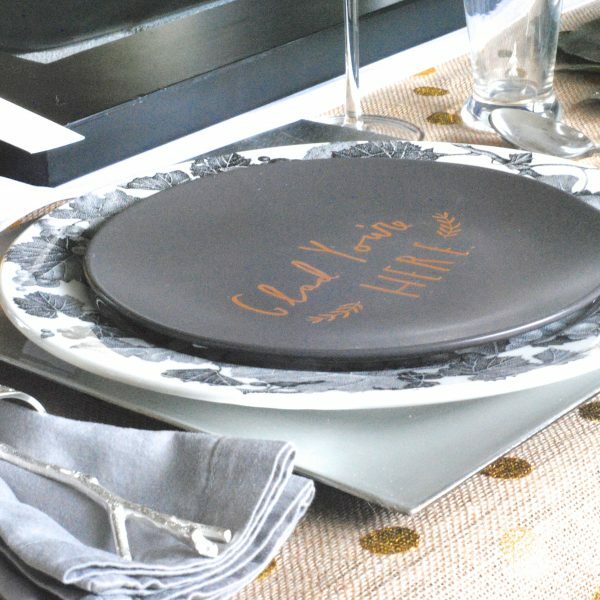 Do you have something special that always makes it onto your Easter table? Anyone else have an apparent duck obsession like I do?!? Happy early Easter, “Peeps”! Lovely post! The baby is too cute..very bright and happy pics! I’m in love with your china. Mine is all still in the storage unit, and oh how I miss setting a fun and eclectic table. You put that together with flair. Bee is looking quite snugglable, but I laughed out loud at Noodles little toothy grin! Oh, happy little mouths of uneven, spaced baby teeth are just so cute! Your ducks are adorable! I always have a mini meltdown when I make waffles. I’m glad to know I’m not the only one that stresses out. Oh I LOOOOOOOVE the decor!!! And those easter cookies are SO cute! Way to go! Your vintage ducks are so adorable. Great willpower leaving the others at the antique store. Your cloche vignettes are really sweet.